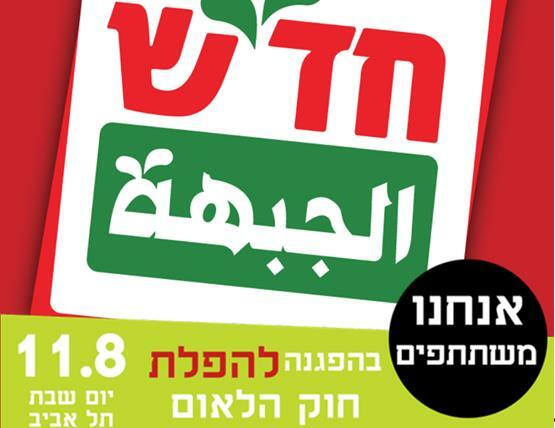 Tonight, Saturday, August 11, a mass Arab-Jewish demonstration will be held in Tel Aviv’s Rabin Square against the racist “Nation-State” law. Organizers of the protest rally hope it will be a milestone, marking the start of a sustained public struggle against the law. The decision to hold the protest was made following a number of meetings among the members of the Higher Arab Monitoring Committee in Israel (which includes representatives of all the political parties and political movements active in the Arab community), the Joint List and the Arab Mayors Association. The chairman of the Higher Arab Monitoring Committee, former Hadash MK Mohammed Barakeh, told Haaretz: “There will always be disagreements and that is healthy; but now there is a decision that everyone is backing, even if there is criticism of actions or positions, because everyone understands that this protest will be the starting point – and not the finish line – of the campaign against the Nation-State Law.” The committee decided that the protest will be held under two slogans: “Bring down the Nation-State Law,” and “Equality.” Yesterday, the Israeli daily newspaper Haaretz published an editorial in its weekend edition in which it wrote: “The demonstration called for Saturday night in Tel Aviv’s Rabin Square by the Higher Arab Monitoring Committee, which represents Israel’s Arab community, is the most important of all the protests that will have taken place [until now] against the Nation-State Law. It is also one of the most important demonstrations in Israel in the past several years. No minority in Israel suffers as much discrimination as the Arab minority, which is also Israel’s largest minority. It is frequently the target of normalized, institutionalized racism… The place of [Tzipi] Livni and the other opposition leaders Saturday night is in Rabin Square, alongside the Arab community. Their struggle is the struggle of all Israelis, Jews and Arabs alike.” On Thursday, a broad range of organizations, movements and political parties issued a joint call to Israel’s citizens to come out and protest, among them were: Hadash-The Communist Party of Israel, Meretz, Ta’al (Arab Movement for Renewal), Standing Together, Peace Now, Givat Haviva, Gush Shalom, The Association for Civil Rights in Israel, Physicians for Human Rights, Negev Coexistence Forum for Civil Equality, Injaz Center, Emek Shave, Yesh Din, Mosawa, Combatants for Peace, The Israeli-Palestinian Parents Circle, Amnesty, Zazim and Wahat al-Salam – Neve Shalom. Last Saturday night, August 4, tens of thousands of people rallied in Tel Aviv’s Rabin Square in a major protest led by the Arab-Druze community against the contentious nation-state law.